True Economics: 19/6/2015: Greek ELA and ECB... What's the Rationale? 19/6/2015: Greek ELA and ECB... What's the Rationale? 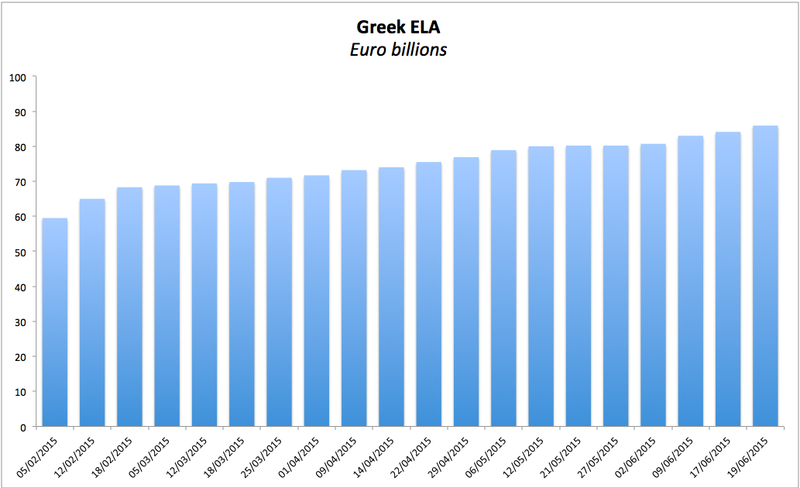 The price of getting Greece ejected or pushed out of the euro has now risen once again as ECB added to the ELA provided to Greek banks amidst a bank run that is sapping as much as EUR800mln per day. In basic terms, ECB is allowing lending via Eurosystem to Greek banks to fund withdrawals of deposits. Once deposits are monetised and shifted out of Greek banks, Eurosystem holds a liability, Greek depositors hold an asset and the latter cannot be seized to cover the former. ECB was very unhappy with doing the same for Ireland at the height of the crisis, resulting in a huge shift of ELA debt onto taxpayers' shoulders via Anglo ELA conversion into Government bonds. Reason 1: increase the cost of letting Greece go. If Greece crashes out of the euro zone, the ELA liabilities will have to be covered out of Eurosystem funds, implying - in theory - a hit on member-states central banks. In theory, I stress this bit, this means higher ELA, greater incentives to keep member states negotiating with intransigent Greece. Why am I stressing the 'in theory' bet? Because in the end, even if Greece does crash out of the euro area, ELA liabilities can be easily written off by the ECB or monetized (electronically) without any cost to the member states. Reason 2: keep Greece within the euro area as long as possible, thus allowing the member states to hammer out some sort of an agreement. In theory, this implies that the ECB is buying time by giving cash to Greek depositors so they can run, in hope that they continue to run at a 'reasonable' rate (at, say, less than EUR2 billion per day or so). In practice, however, this is a very short-term position. Reason 3: ECB is monetizing Greek run on the banks in hope that Greece does crash out of the euro. Here's how the scheme might work: increasing ELA for Greece weakens Greek banks and, simultaneously, strengthens the incentives for Greece to exit the euro once deposits left in the system become negligible and the economy is fully cashed-in. On such an exit, Greek residents will be holding physical euros that cannot be expropriated by the Eurosystem, and thus Greece can launch drachma at highly devalued exchange rate, while relying on a buffer of cash in euros held within the economy. I am not going to speculate which reason holds, but I will note that all three are pretty dire. Take your bets, ladies and gentlemen.